It’s no secret that ocean swimming is my greatest love, born from my greatest fear. But it’s only through consistent practice that I’ve learned to love it. So it was with some trepidation, after 5 weeks off surf sessions learning how to be an Inflatable Rescue Boat (IRB) crewperson, that I approached Saturday’s surf session. I spent part of the morning working on engines with the IRB crew ensuring my mind was in the gutter. Owing to the 6-10 foot sets coming through, Zoe and Kingy wisely choose a gutter session to match where my head was at. When the surf is that big, the water is moving so fast it creates a littoral current that runs parallel to the beach – creating a natural gutter between sand banks. The body surfing gurus, Hossy and Stirky headed out the back. There are those who excel in big waves, and then there are those, like me, for whom they can be an ordeal. About three quarters through the session I tightened my goggles and decided to join them. This wasn’t done lightly. Exactly a year ago I completely shattered my surf mojo upon the sand owing to a shore dump spearing. This is what happens when you show up late to a session and miss the warm up. Don't disrespect the coaches by doing this. There are four of us heading out, and at one point I lose my nerve and head for home, catching a big broken wave and thinking “this is going to hurt”. It doesn’t and buoyed by that thought I strike out for the back, beyond the break, again. That moment where you get out the back, you reach comparative safety, when you collect your thoughts and your breath is a truly golden moment. That moment when you realise you’re not out the back and a seemingly monster set is about to break on your head makes you wish you’d worn your brown swimmers. There is no choice but to dive, dive deep, and hope like hell you can grab the sand and hold on. When you get it right, the wave surges over you, sounding like a 747 taking off above your head and obscuring the light. Then the spray off the crest speckles the sunlight cascading through the water and there is nothing more beautiful. You come up in the clear water between the waves, take a breath, ready and prepared to dive under the next one. When you get it wrong, there is nothing more scary. 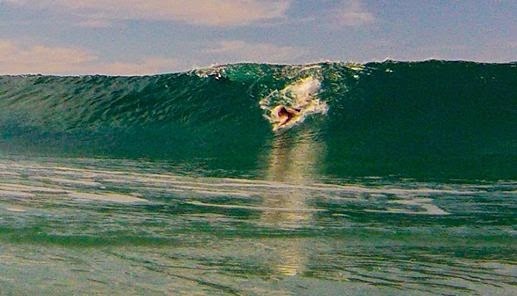 I got under the first two fine, but the waves inevitably build through the set and the last one caught me in the backwash as I dived under. Funnily enough, the thought “this is going to hurt” relaxes me. I give into the wave as it washing machines me every which way, knowing eventually, it will throw me up long enough to grab another gasp of air. Eventually, it will spit me out. So long as I bend to its will. And, for the first time, in a long time, I keep my eyes open through this process rather than screwing them shut. The foam is truly mesmerising. The wave washes on, leaving me behind, the water clears and I survey the situation. Do I head for shore or back beyond the break? I’m still a long way out so I head well clear of the breakers and wait. I regroup with my buddies. I catch my breath and calm down. And let myself bend to the will of the unbroken waves. Bobbing about like a cork. Until I find a lull in which to return to shore, I'm not yet brave enough to body surf big waves. 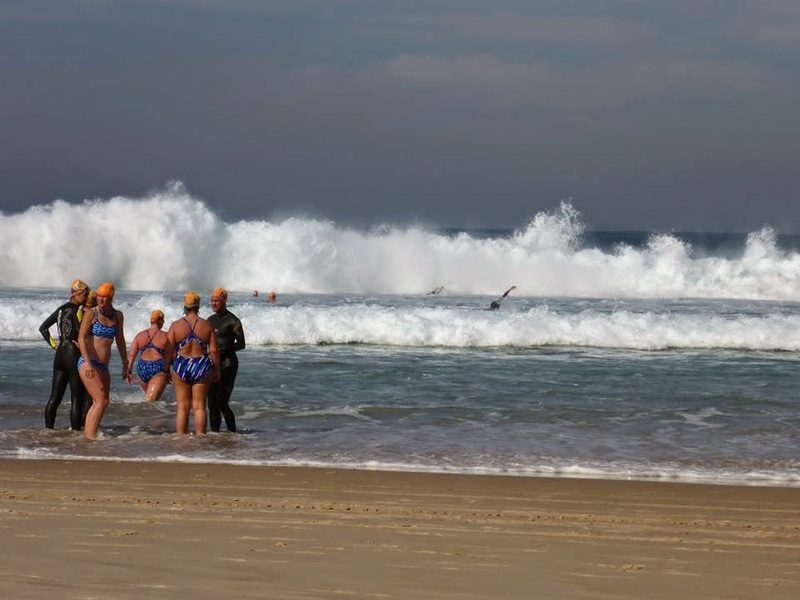 The funniest part is, once we returned to shore, one of my fellow not so surf confident friends, who’d been right inside the break zone remarked that he only felt comfortable admitting how scary it had been once “the surf lifesaver” swam up and remarked “oh my god”! As though, in obtaining my bronze, I had somehow managed to vanquish all my fears at once. No such luck. But I’ll definitely have a go these days. And that means I’ve come a long way, baby. 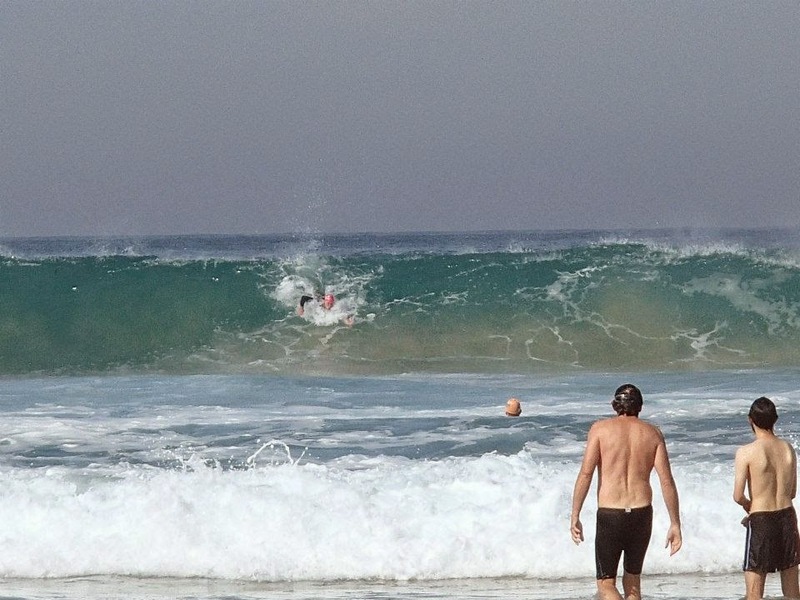 Colin, one of my first surf coaches, nailing a wave with Bondi Fit. Photo (c) Bondi Fit. 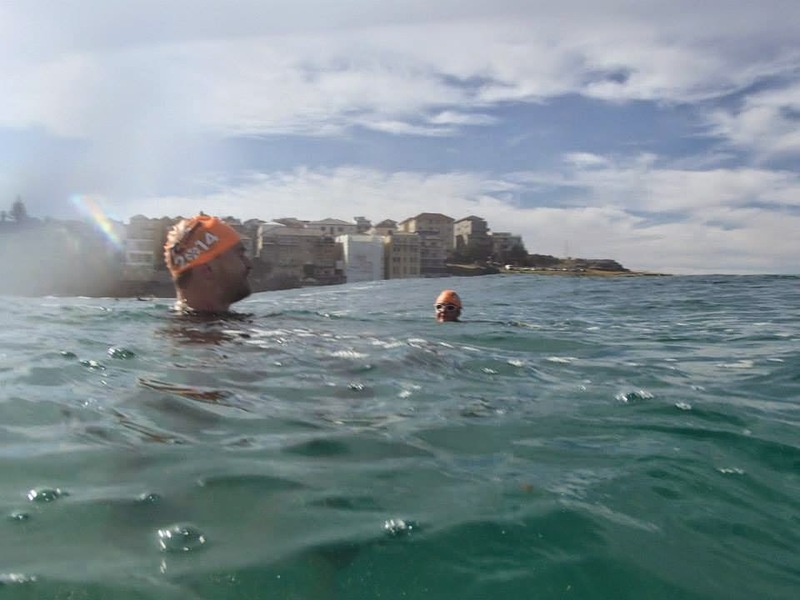 Bondi Fit's head and founding coaches, Spot Anderson, is one of the best body surfers you will see. Longy, another of my first Can Too coaches is also completely at home in conditions such as these. Watching the wave that built at Mermaid's rock (headland) and broke at the Boat Ramp. Photo taken by the lovely Bel with Kingy's camera. Bobbing around out the back.